Today we have a two nighttime scenes selected for our Past/Present feature. Both artist featured below, Art Werger and John Sloan, are masters at composing implied narratives, compelling beyond the inherent beauty of brooding blacks intertwining with illuminating whites. They are experts at creating atmosphere, an emotional depth and sense of human vulnerability- here using light from a single lamp to expose two very human and private moments. “I always think of shade as being full of light. That is why I like to use the word shade rather than light and shadow. Shade seems to play over the thing, envelop it, better define it, while shadow seems to fall on the thing and stain the surface with darks.”- John Sloan. Image on Left: Rag Pickers. By John Sloan. 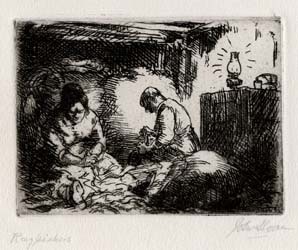 Etching, 1913. Edition of 100, printing of 55. Image on Right: Calling Home. By Art Werger. 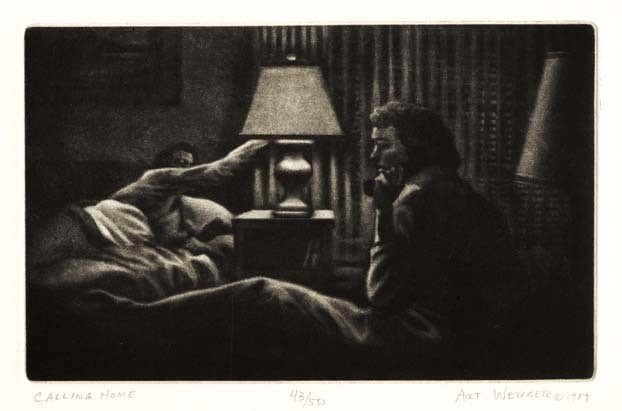 Mezzotint, 1989. Edition of 50.